As I sit here and write this it is yet again snowing here we have had a White Christmas, I know for some people this is not unusual but we have had had snow on and off for the last 2 weeks it does look nice when it is just laid but has not been fun to walk on once it has become compacted I dare say there has been alot of broken bones! I have finally started Fa-La-La by LHN, I did actually start it 3 times as I could not decide the count of fabric or the colour, I finally decided on a light apricot 32ct linen which I had in my stash, it still seems quite big on that. 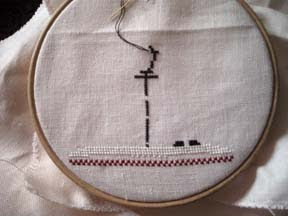 I have also started my Birth Sampler which needs to be stitched by the end of March so that I have time to have it Framed for May 2nd when I am a Godparent for my Nephew Thomas, I have not done any large projects for a while and was horrified when I was getting the fabric ready how big it was.Unfortunately I have 3 nights to do this week so that means no stitching for 3 days. 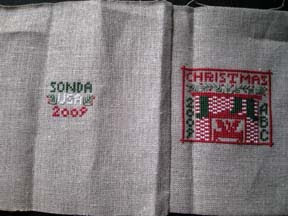 I received this from Sonda in the post on New Years Eve it is a lovely square from The Prairie Schooler called Cranberry Christmas, it was from JCS 2007 Ornie issue. 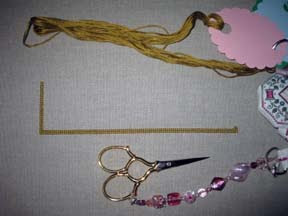 I shall be making this up soon to go on my Tree next year. I think a lot of people found Fa La La quite big...but beautiful nethertheless..it was one of my favourite stitches. Good luck with the birth sampler! Two nice starts indeed. And you will see that you have plenty of time to get the birth sampler finished by March.